Opening Ceremonies: President Scott Kimball called the meeting to order. Invocation by Marc Rich and we said the Pledge of Allegiance. Door Prizes: There were no door prizes due to the shortened meeting format. Rotary Minute: President Scot shared the fun and excitement of the young bicycle riders being measured and receiving their helmets at last Saturday’s Bicycle Rodeo Service Project at Ellsworth Elementary / Middle School. 50/50: The 50/50 drawing was not held due the shortened meeting format. Happy Dollars Highlights: No Happy Dollars due to shortened meeting format. Rotary Business: 1) Pres. Elect Tracy Shaffer applauded the clubs effort and our Auction partner (Maine Coast Memorial Hospital) at our Very Successful 67th Annual Charity Auction held last Friday evening; 2) Service Coordinator Clyde Cushing thanked the club volunteers who worked the Bicycle Rodeo; 3) It was announced that our annual Paul Harris Recognition night will be held on Tuesday, June 12th at Big Cats Event Center in Trenton… A sign-up sheet was circulated and the membership will receive an email shortly with all the details and an opportunity to register online; 4) Visiting Rotarian Barbara Quimby from Florida encouraged all Rotarians to participate in a Rotary Fellowship opportunity as she is doing over the next few months at the Schoodic Institute. 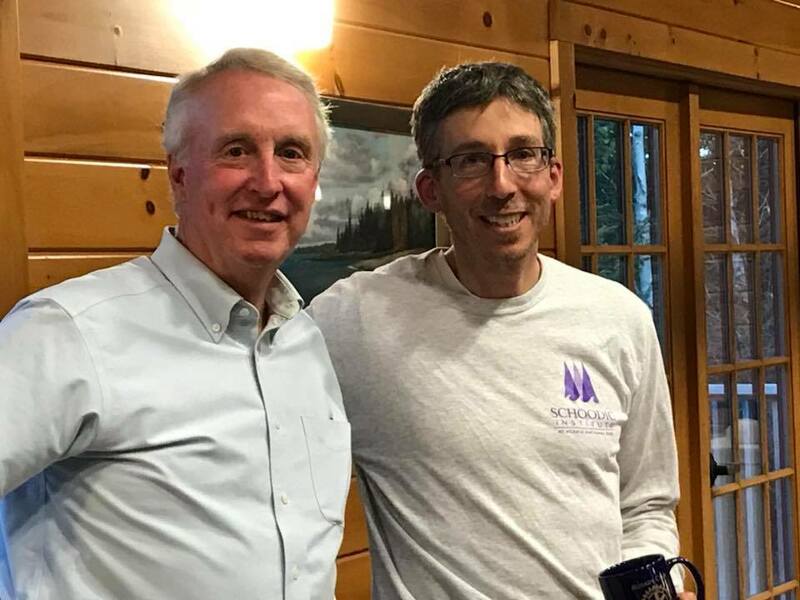 Program/Speaker: Our program featured an historical overview of the Schoodic Institute at Acadia National Park (which also manages the Schoodic Educational Research Center) as well as a presentation featuring one research project being conducted at the institute. Peter Collier, Senior Advancement Associate at the Institute (and Ellsworth Rotarian) shared a brief history of the Institute and the campus which dates back to 1935 when the US Navy began operating a “Listening Station” at the site through the base closure in 2002 and up through the formation of the Schoodic Institute at ANP. Peter also shared the many types of activities from boarding 5th and 6th grade students at the Science Academy to hosting conferences and board retreats. Nick Fisichelli, PHD Scientist and Director of Forest Ecology at the Institute spoke about his research at the Institute. 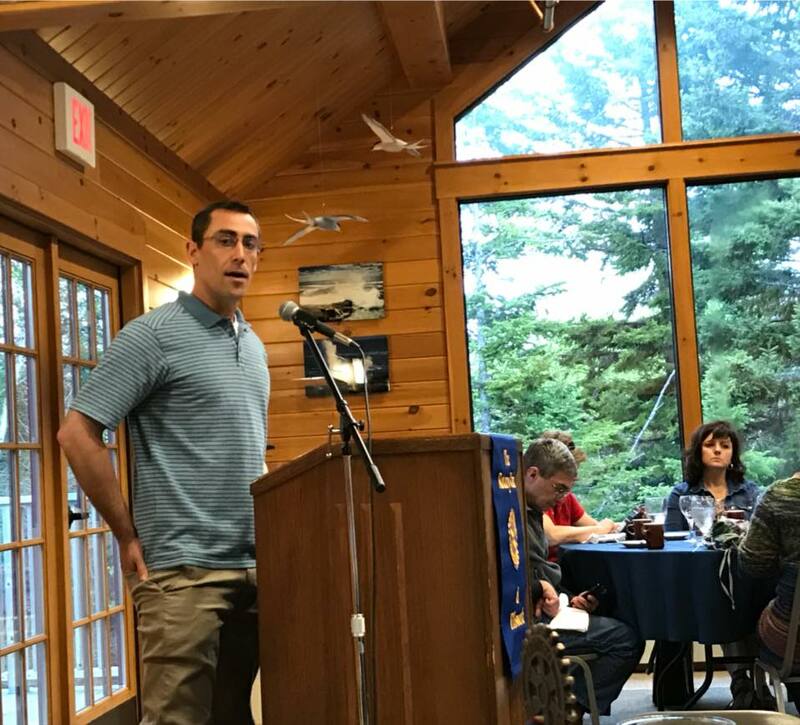 Nick shared that the mission of The Schoodic Institute at ANP is to Engage Citizens in Authentic Science seeking sustainable solutions in a rapid changing world using Acadia National Park as a living laboratory. The science should be : Participatory; Authentic and Rigorous; Applied; and Fun and Engaging Work. Nick’s main research project studies the variety of trees in our local forest… and then attempts to predict how they will fare and what the forest will look like in the future as conditions change. He is also involved with an attempt to restore the vegetation and habitat on top of Cadillac Mountain in ANP which has been stressed and changed due to the millions of visitors it receives each year for the past decades.